The latest volume features articles on the The Temple of Ramesses II at Gerf Hussein, which describes the history of the temple, now partially rebuilt at New Kalabsha. 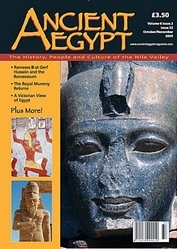 Other features include articles, on the Rameses II at the Ramesseum and the British Museum, the The Royal Mummy Returns - but is it Rameses I, Dylan Bickerstaffe looks at the evidence. The Identity of the King and the Sun God which looks at the links between the movements of the stars and planets and ancient Egyptian mythology, and A Victorian View of Ancient Egypt, and a glimpse of Egypt through the photographic albums of Victorian visitors.